In the heart of a village with all amenities, vast and exceptional manor house of the 18th century with an ordered facade, 14th century vestiges (geminated windows) as well as the old stables of the castle (16th century) with oak feeders. The main house, largely renovated, has 3 levels served by two staircases: a large elegant staircase and a small Provencal staircase; in fact, it is 2 houses united in one.On the ground floor, 2 entrance halls, cloakroom, washbasin, shower and wc, large living room, large bedroom I with fireplace and bathroom + wc.On the south side, the authentic vaulted kitchen with its very large vaulted cellar, the dining room with double arches (ogives) and fireplace, the old stables of the Castle (16th) and a vaulted billiard room.On the first floor, a library lounge with fireplace, a study with fireplace, a large bedroom II with fireplace, bathroom + separate wc, and a dressing room.On the south side, a large workshop with shower room and wc, laundry room, large bedroom III with views, bathroom and wc, as well as a terrace.On the 2nd floor, the bedrooms IV, V and VI share a bathroom and toilet. 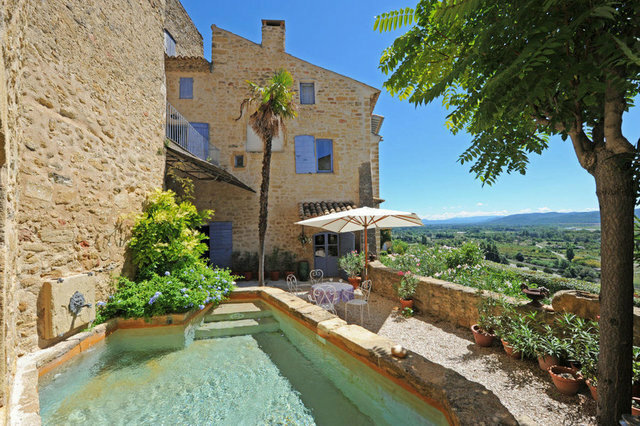 An attic remains to be converted with the possibility of making additional bedrooms.The south-facing garden with a stone pool and fountain offers panoramic views of the Durance (from the Sainte Victoire mountain to the Pont-Royal golf course), as well as the Château gardens. An outdoor dining room, a summer lounge, outbuildings (2 small workshops, garage for 4/5 cars) complete the property. Above the garage but with an independent access by external staircase, a large space can be a workshop, an friend's apartment or a boutique.